Harper Paperbacks: New York, 1990. 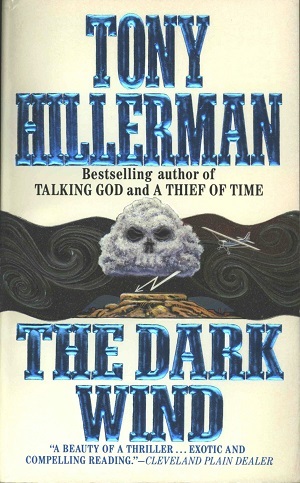 This is the second edition of The Dark Wind published by HarperCollins in New York in 1990, as an inexpensive Harper Paperback version. The cover illustration is by Peter Thorpe, and depicts a plane flying toward a skull shaped thunderhead with lightning striking a mesa below and a dark swirling wind in the background. Format: Paperback, 17 x 10.6cm. Binding: Paper cover with a full-color graphic illustration on the front and back covers. The publishers device is printed horizontally on the spine, and the skull cloud, title, and author are published vertically on the spine.